Alchemy Film and Moving Image Festival is now accepting submissions of short films, features, installation proposals, curated programmes and film-performance proposals. Works made in 2015 or 2014 will stand a greater chance of success. Scottish premieres are preferred but not essential. There is a £5 entry fee (approx $8 / €6), or $9 if using FilmFreeway. We accept submissions of works related to any subject area, though this year we are especially interested in works that may relate to the idea of the “Altered State”, including notions of transcendence, political transition and subversion, shifts in personal or visual perspective, psychological and material change, mental or spiritual transformation, excavations of notions of contemporary counterculture. Alchemy Film and Moving Image Festival is Scotland's international festival of experimental film and artists’ moving image. Submissions of artists’ and experimental film from any part of the world are welcome - we celebrate a diverse range of works: the visually experimental, quietly poetic, formally radical, psycho-geographical, politically activist, culturally subversive, psycho-spiritual, the alchemically volatile, the underground and bizarre. Conventional or commercial-style narrative dramas, animations and documentaries are less likely likely to be successful – unless they are truly original in form and content. Alchemy Film and Moving Image Festival is working toward its sixth edition. It is a not for profit venture, run as a partnership between Alchemy Film & Arts and our main venue partner, Heart of Hawick. Alchemy Film & Arts is a registered Scottish charity. 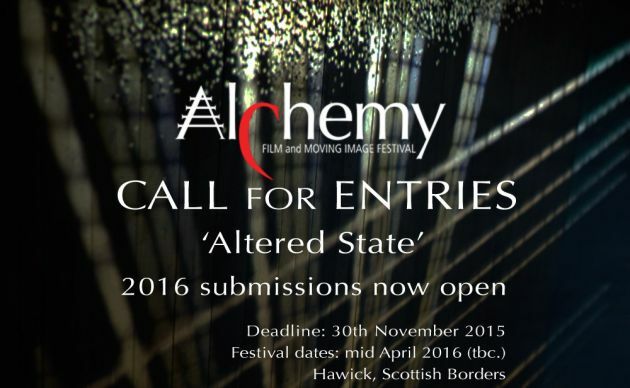 Alchemy Film & Arts is a registered Scottish Charity: SC042142, Company No 452485.